You can visit our gallery or forum for tips, creative ideas, and support from the new Woodrich Brand community. What Makes Woodrich Brand Timber Oil the Best Stain for Staining a New Deck? Most deck stains and sealers will tell you not to apply them to new wood. Even if they don’t, most builders will tell you that you can not stain your wood right away because the wood “won’t take the stain.” In most cases this is true. New wood is usually high in moisture content. This will prevent most deck stains from penetrating correctly. They may look pretty nice going on, but soon you will have a cracking, peeling mess. Woodrich Brand Timber Oil stain is unique in that it is ideal for staining a new deck. It was formulated to penetrate deep into the wood, even if it has a high moisture content. This means you can stain your new wood deck, dock, fence, siding or log home right away. There is no need to let you wood “weather” or age prior to application. 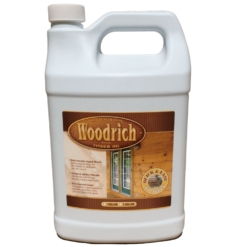 Woodrich Brand Timber Oil stain is extremely easy to apply. You can stain your wood with a pump style garden sprayer, stain pad, brush or any other application tool. Timber Oil can also be applied to older wood and is a very maintenance friendly finish. You never have to strip Timber-Oil between applications. Just wash the surface with water and apply another coat. This stain will never crack or peel. If you have a weathered wood deck, fence or wood siding we can help you restore it to a like new condition and keep it looking great for years!